Ulster People endorses 12 candidates for Ulster County Legislature! Anyone who wished to seek the group’s endorsement, regardless of party, was asked to complete a questionnaire which was reviewed by the Ulster People screening committee. If the responses showed a strong alignment between the candidate’s views and actions and Ulster People’s platform, candidates were invited to interview with the screening committee, after which, the committee voted to recommend endorsement (or not). Candidates were also given an opportunity to address the membership of Ulster People at a general meeting. The voting members of Ulster People made the final endorsement decisions. Any candidate who wished to seek the group’s endorsement, regardless of party, was asked to complete a questionnaire. An endorsement committee comprised of voting members reviewed the questionnaires. If the responses showed a strong alignment between the candidate’s views and actions and Ulster People’s platform, candidates were invited to interview with the endorsement committee, after which, the committee voted to recommend endorsement (or not). The voting members of Ulster People made the final endorsement decisions. A candidate must receive the support of at least two-thirds of all voting members to receive an endorsement. Ulster People may consider additional endorsements for county legislature at our May meeting. Posted in endorsementsLeave a Comment on Ulster People endorses 12 candidates for Ulster County Legislature! 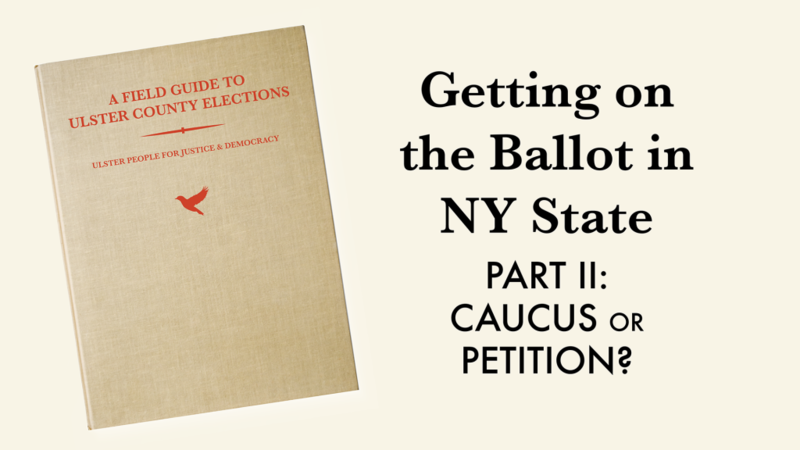 Getting on the Ballot in NY State Part 2: Caucus or Petition? 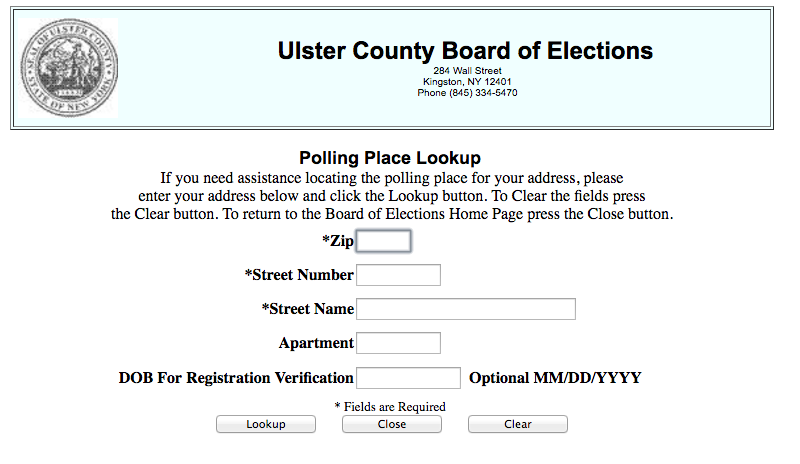 This post is an excerpt from our forthcoming The Ulster County Electoral Field Guide, developed by Ulster People Vice Chair Penny Coleman. We have done our best to ensure its accuracy as of March 2019. Party nomination of candidates for elective office is made at either a party caucus or in a primary election. In Ulster County, petitioning is used for all state and county-wide offices, legislative seats, and some town offices. If more than one candidate from the same party submits enough valid petition signatures, there will also be a primary election. The City of Kingston and the Towns of Woodstock and New Paltz have switched to petition, but in other towns the caucus is still used. 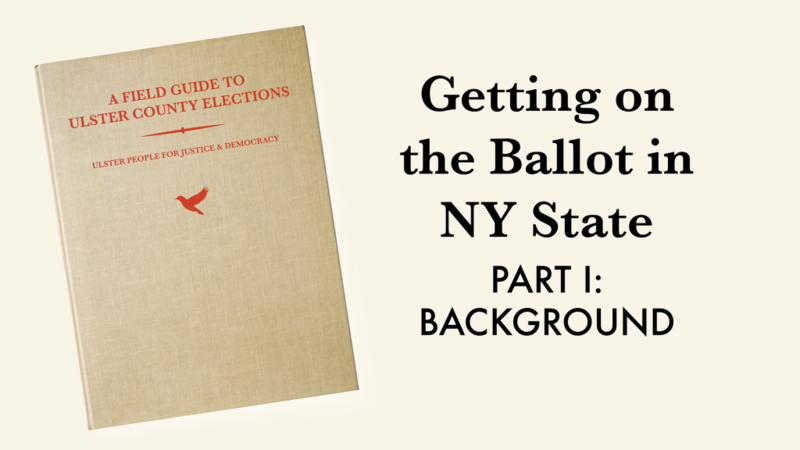 Posted in elections, Field GuideLeave a Comment on Getting on the Ballot in NY State Part 2: Caucus or Petition? Election laws and procedures are different everywhere you go in the U.S. and at every level of federal, state and local government. The way things are done in Ulster County might be similar to the way things are done in Columbia or Green, but don’t count on it. It’s always best to make sure you understand what the specific local rules are for the office you are seeking. Check with the BOE and never assume that what was true for last year’s election will be true for the next. If you think voting restrictions are only a southern shame, think again. New Yorkers have endured some of the most restrictive voting rights laws, and consequently one of the worst records on voter turnout, in the country. In 2016, we ranked 41st in voter turnout. That was an improvement over 2014, when we ranked 49th, with only 27% of eligible voters making it to the polls. Do you have a friend, family member, co-worker or neighbor who you think would make a great candidate? 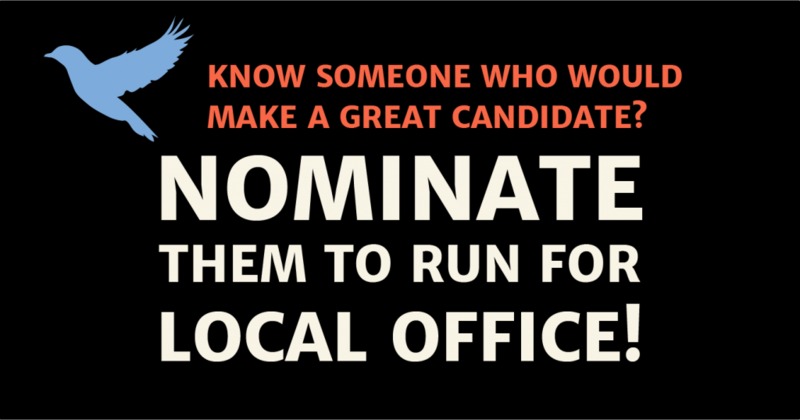 Nominate them to run for local office! We are looking for leaders who genuinely represent their community. We are especially eager to support candidates who are women, people of color, and come from economically disadvantaged backgrounds. A lot of the best candidates aren’t seeking the spotlight — they might have not even considered running for office before. Your nomination could plant the seed of something great. Running for office can be intimidating, especially if you don’t have access to wealthy donors and political insiders. Ulster People is working to change that. Our volunteers have years of collective experience working on local campaigns in Ulster County, and we’ve developed materials designed to quickly bring first-time, grassroots candidates get up to speed. 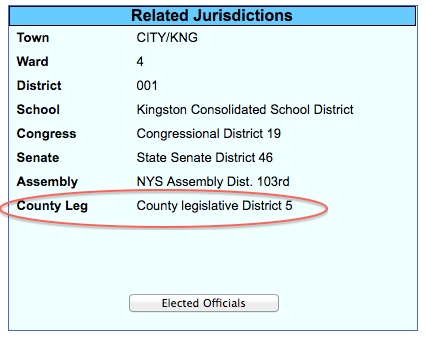 This November in Ulster County, all 23 county legislative seats are up for election. Many other local offices are also on the ballot. If we care about building a more diverse and energetic bench of politicians, this is the year we need to do. the. work. But because of New York State’s recent primary consolidation (overall, a good thing! ), the time frame for deciding to run and get on the ballot has been greatly condensed from past years. We have less time to recruit great candidates, which makes your nominations all the more important! People are waking up to national politics — how about local? Every month, our 23 Ulster County legislators make decisions that matter: about justice, our environment, our economy, and how we treat the most vulnerable among us. This November, all 23 county legislative seats are up for election. Other local offices are also on the ballot. This is our moment to make real change at the local level. Now is the time to learn about your legislator, research their voting record, and make sure they represent your values. If you feel your legislator doesn’t represent you, perhaps you would consider running yourself – or maybe you know of a friend or neighbor who would make a great candidate? 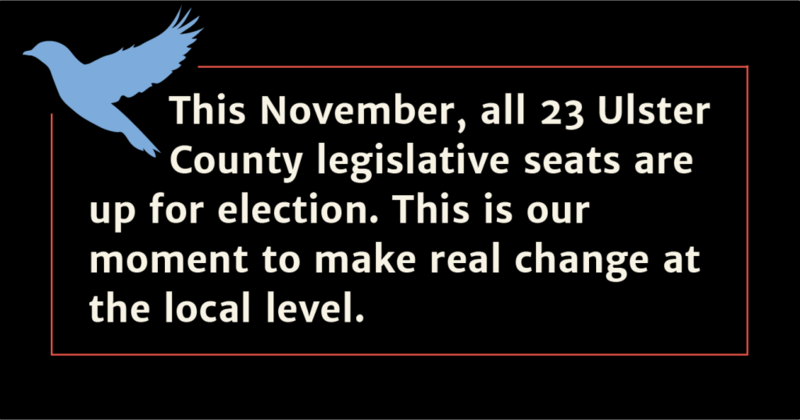 Every two years, on odd-numbered years, we elect 23 “legislators” to serve as our representatives in the Ulster County Legislature— the legislative, appropriating and policy-determining body of our county. Our legislators make a lot of decisions that impact our daily lives— maybe it’s a job for YOU! Who can be a county legislator? Any registered voter can run for the office of county legislator, as long as she or he lives in the district they seek to represent and don’t hold any other elective public office. What does a county legislator do, in a nutshell? Enacts, amends, or rescinds local laws and resolutions. Sets our county government’s administrative policies. Approves the county budget and authorizes spending of our county tax dollars. Decides the compensation and benefits of county employees. What does the job look like, day-to-day? Legislators attend a LOT of meetings. In addition to the monthly legislative session, they typically serve on at least two standing committees, some advisory committees, and they caucus with fellow legislators in advance of regular sessions. Legislators read and study documents. Many documents. Hundreds of documents. Legislators debate and discuss things with allies, opponents, and everyone in between. Legislators spend time out in public, hearing from constituents, talking to the press, joining in community activities. Legislators make $14,000 per year plus the option of health insurance coverage. They also have the opportunity to build up savings through contributing to the NYS retirement system. Legislators work mostly on weekdays and weeknights (and occasionally weekends) and the number of hours worked each week varies widely from legislator to legislator for a variety of reasons. You CAMPAIGN for it, and that’s practically another job in itself—the job of candidate. Successful candidates, in addition to having the skills to be a legislator: (1) have the time and enthusiasm to knock on doors and make phone calls just about every day; (2) have a good personal network and are able to put together a team to help reach out to voters; (3) have a clear message about who they are and why they are running; (4) can secure endorsements of political parties and organizations, and (5) can raise enough money to win (an estimated average of $10,000 for a county legislator race). If you support the Ulster People platform and think this sounds like it might be a job for you, we’d like to hear from you! Email us at runforoffice@ulsterpeople.org for more information or apply for an endorsement. Ulster People for Justice & Democracy is platform-based political organization, independent of any party, that evolved out of the grassroots group Ulster County Volunteers for Bernie (aka Ulster4Bernie). As Ulster4Bernie, we coordinated the petitioning effort in CD-19 to get Senator Bernie Sanders on the NYS Primary ballot and secured more signatures than any other Congressional District in New York (February, 2016) and sent two delegates for Bernie to the 2016 Democratic National Convention (July, 2016). We then elected one of those delegates to represent the 103rd Assembly District on the New York State Democratic Committee (September, 2016). Local candidates for public office seeking to receive the endorsement of Ulster People should fill out our Local Candidate Endorsement Questionnaire. Our screening committee will contact you following receipt of the questionnaire. The committee will make a recommendation based on platform support and viability as a candidate. Final endorsement decisions are determined by a vote of our voting membership. 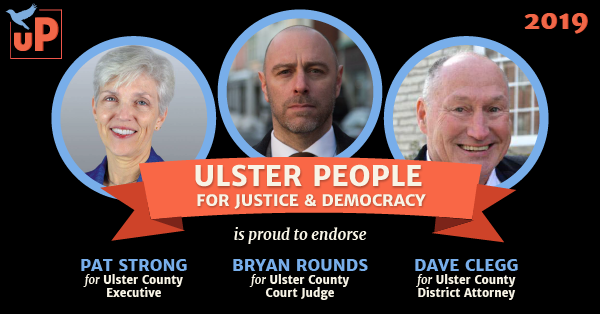 We are pleased to announce that Ulster People for Justice and Democracy is now accepting applications from candidates seeking our 2019 endorsement in county legislature races. We ask that county legislature candidates seeking our endorsement complete our 2019 Candidate Questionnaire and submit a resumé and candidate bio to runforoffice@ulsterpeople.org by Friday, March 31. Our steering committee will reach out to candidates to schedule an interview after receiving their questionnaires. The first round of interviews are tentatively scheduled for March 6, 9, and 10. Candidates are encouraged to submit their questionnaires as soon as possible as interview slots are first-come, first-serve. Candidates will also have the opportunity to address our voting membership at general meetings. Our next meeting is on Monday, March 11 from 6-8 PM in Rosendale. We can accommodate up to six candidates. Candidates may request a slot upon submitting their questionnaire. These slots are also first-come, first-serve. At the following general meeting, on April 8, candidate presentations may be limited to candidates who receive the recommendation of our endorsement committee. The committee will make a recommendation based on platform support and viability as a candidate. Final endorsement decisions are determined by a vote of our voting membership. That vote is tentatively scheduled for the evening of Monday, April 8. Voting Members of Ulster People will convene to vote on possible endorsements in county-wide races (County Executive, DA, and Judge). We will also hear updates from working groups. This meeting is not open to the public, but those interested in becoming voting members of Ulster People may request an invitation to observe the vote, and learn how to get involved in our working groups. Please email connect@ulsterpeople.org to request an invitation. We will hold a separate endorsement vote at our March 11 General Meeting for county legislative candidates. Since current County Executive, Mike Hein has announced his impending resignation*, there are now three (3) candidates vying for the nomination to run in the General Election November 8th. At this Candidate Forum, voters will be able to hear from each candidate and submit questions to the candidates. The public is welcome. Doors will open at 1 pm. *Should Mike Hein submit his resignation prior to May 8th, there will be a Special Election on a date dependent upon his resignation date. In this case, the Ulster County Democratic Committee will convene for the purpose of selecting a candidate to finish the current term held by Mike Hein, which expires December 31st of this year. How are Your Tax Dollars Being Spent? What is the Role of the County Executive? Approving or vetoing in writing every proposed local law, and the appropriate resolutions. Attending this meeting? You can use this simple reporting form to take notes. Note: if you would like to fill out the form digitally, please download it first. If you use your browser to enter in the information, your responses may not be saved. Feel free to instead print out a paper copy, complete by hand, and then send a photo or scan. For more details about how to observe a county legislature meeting, please see here.